When most people think of winter, visions of snow, ice, and freezing cold temperatures flow through their heads. As you are probably aware, I’m not like most people, so my visions are filled with amusement parks and roller coasters! “How is that?” you ask. 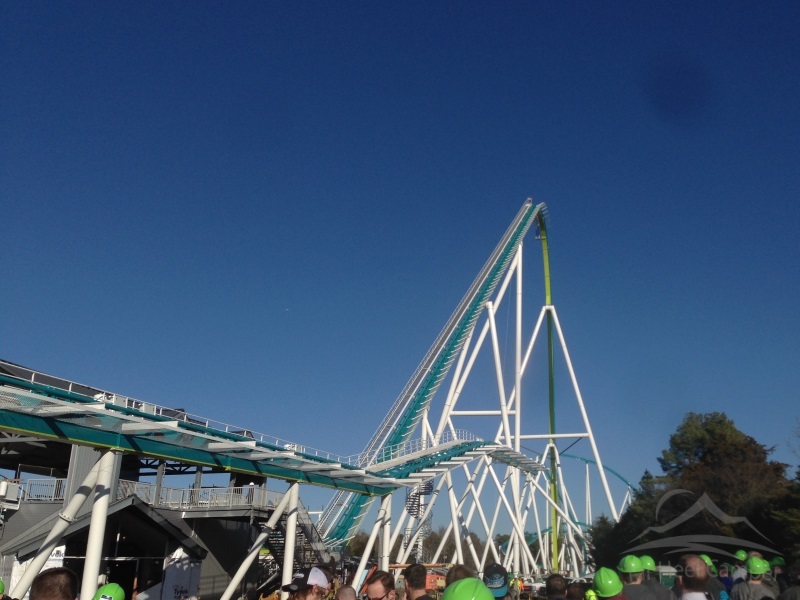 Thanks to American Coaster Enthusiasts (ACE) and their off-season event, Winter Warm Up, I get a cure to the winter blues with some fun (in the sun, hopefully). 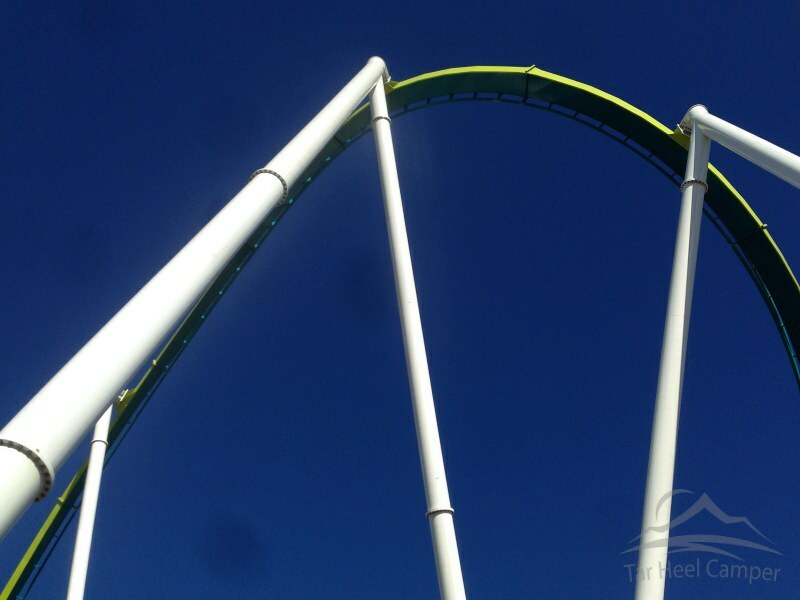 Love roller coasters? 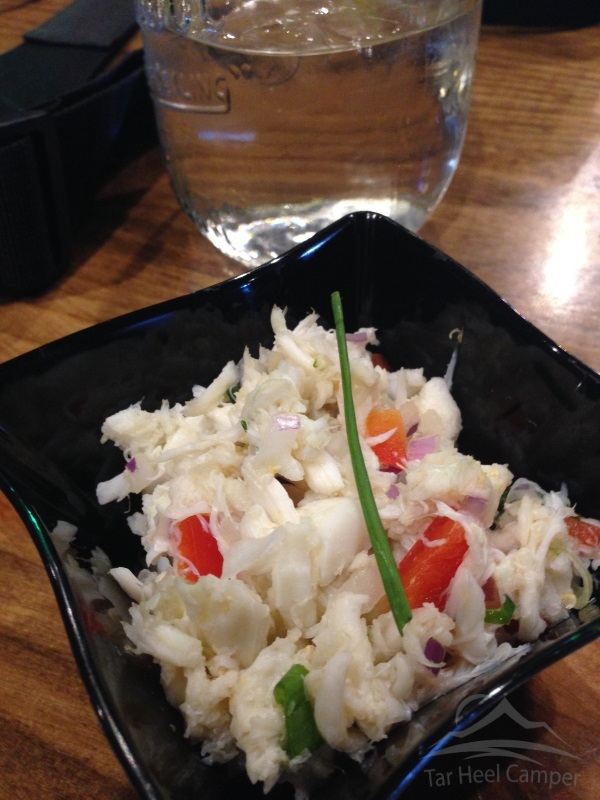 You’ll want to check them out. 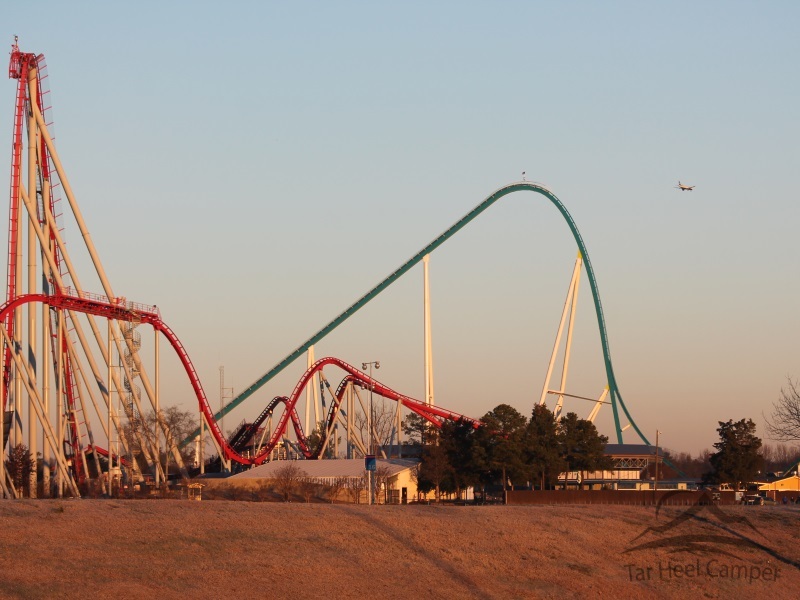 Carowinds is our host park this year and the big excitement, of course, is over the world’s tallest and fastest giga coaster being built right here in our back yard. We arrive at the park while the sun is rising. 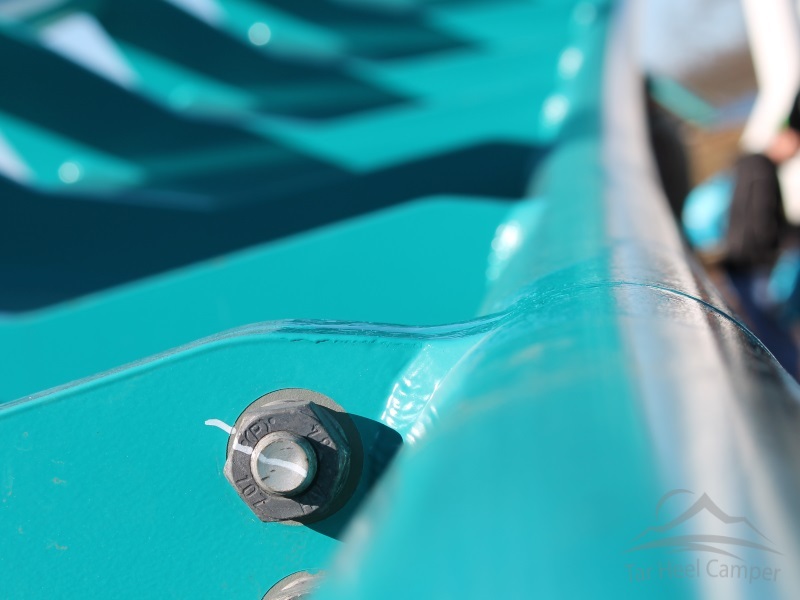 If you would like to take some pictures of your own of the entrance and Fury 325 construction, the park encourages your excitement. Please remember not to trespass outside of the drop off area and make sure you take your trash with you. While we were spending most of our time in Harmony Hall, we were certainly going to get a chance to tour some of the park and various construction sites since we were treated with beautiful weather in the mid 50s. 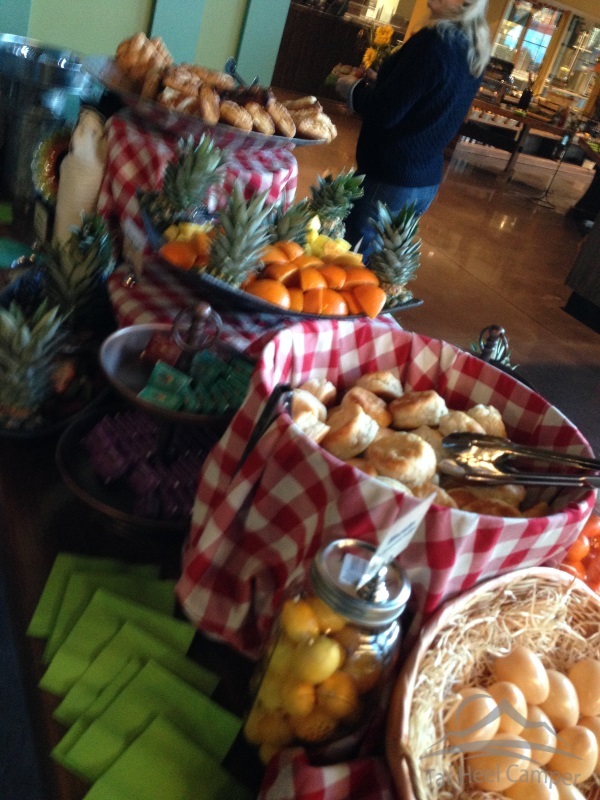 The spread for breakfast is greatly appreciated – and delicious! 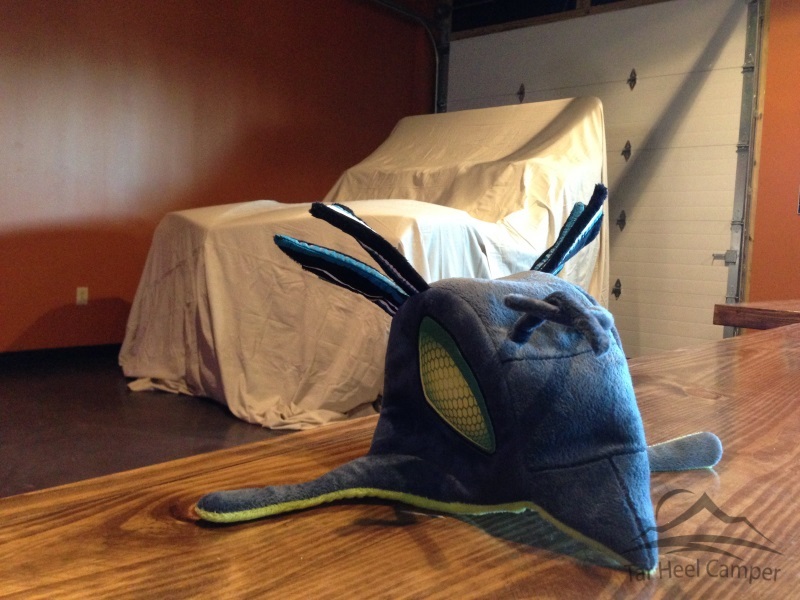 Hiding in the corner is a Fury 325 hat. 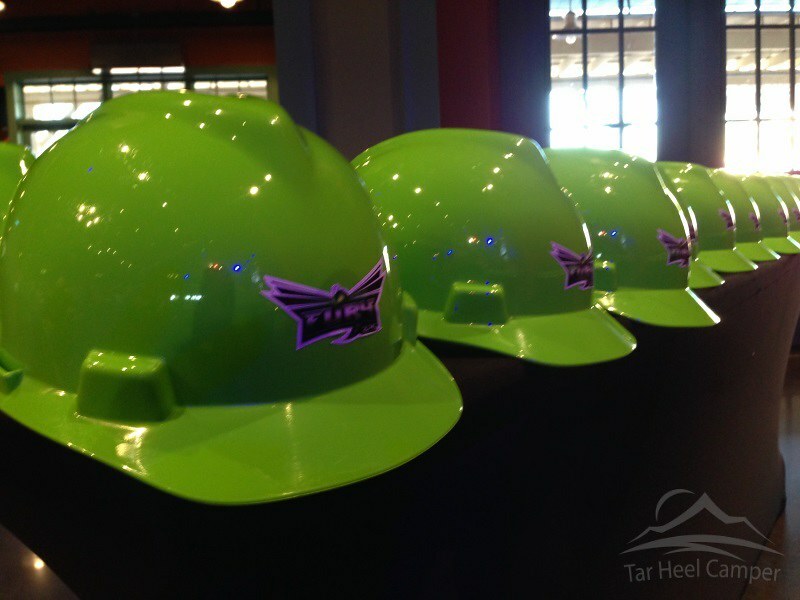 And in another corner are tables full of Fury 325 construction hats. A cheer goes out from the crowd as it’s announced that these are ours to keep. 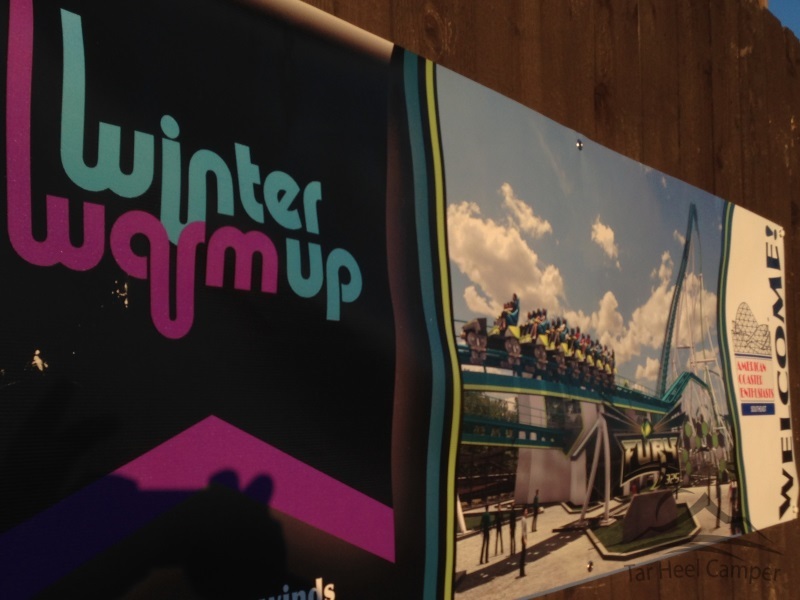 Speaking of the crowd, we set a record today, for the most in attendance at a Winter Warm Up event. I hope we can continue to set a record every year. 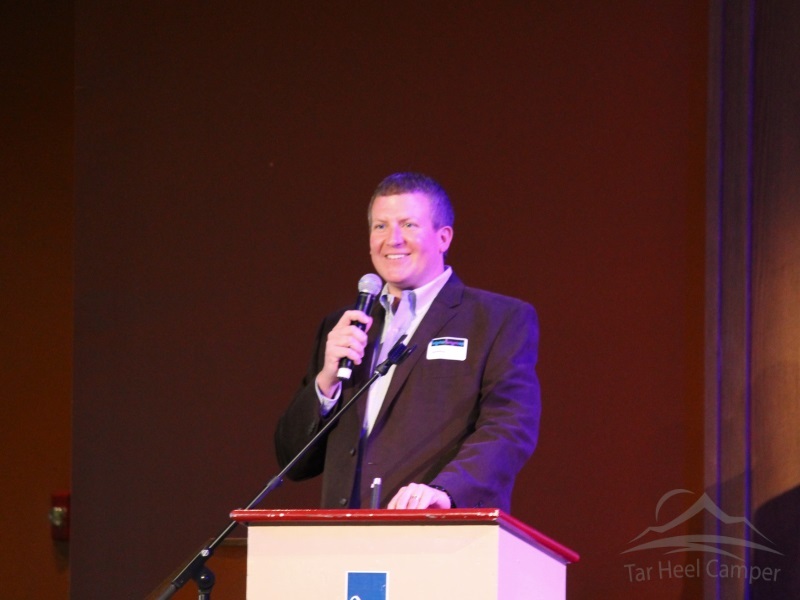 The Park General Manager, Mike Fehnel, starts out the day greeting us. 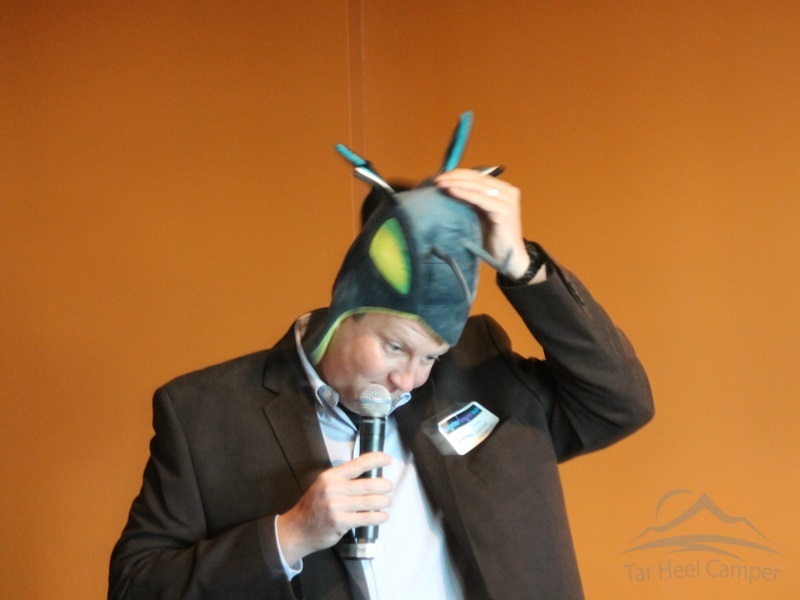 He demonstrates how to wear the Fury 325 hat. This year we lost a beloved friend, Max Cannon. 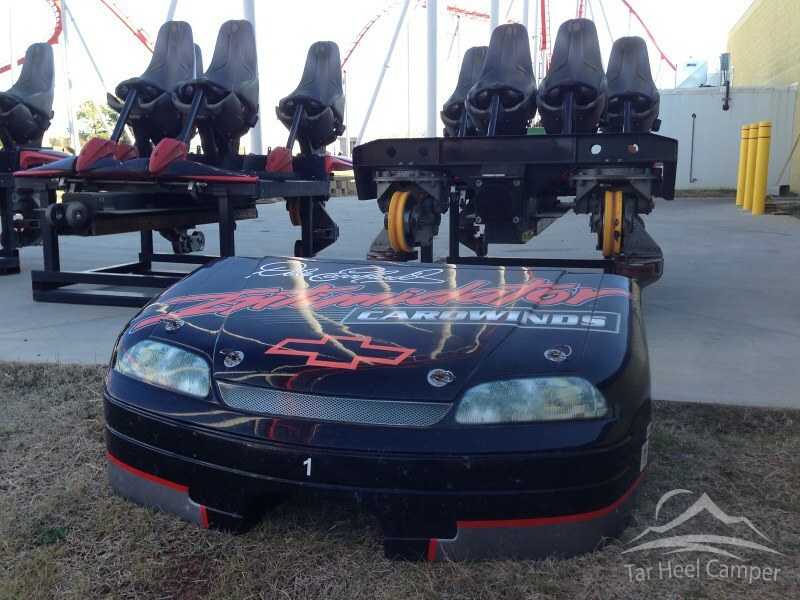 He was a long time ACE member and heralded the relationship between ACE and Carowinds. 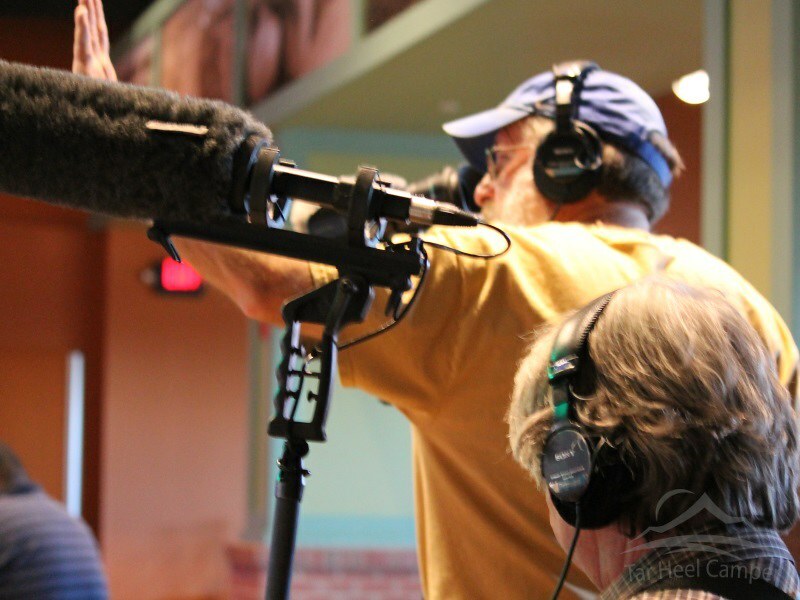 Without his diligent efforts, none of these events at the park would likely have existed. 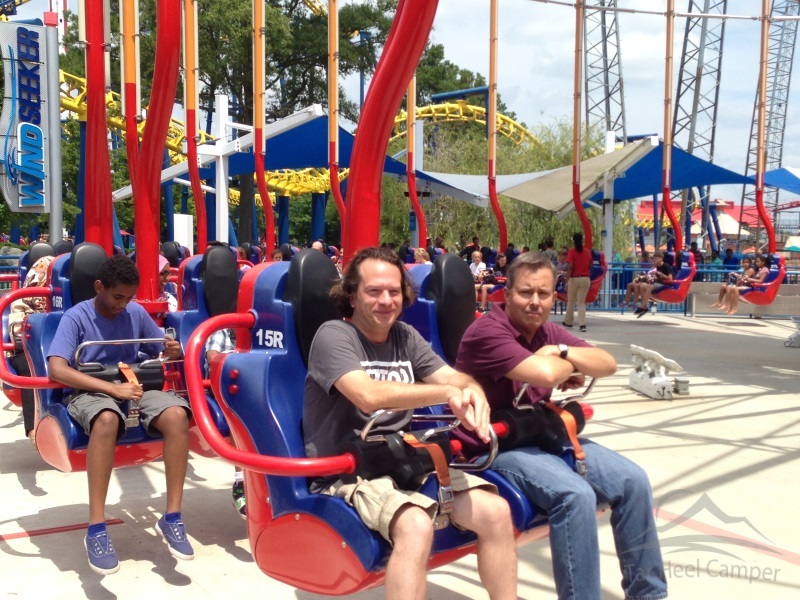 He loved amusement parks and roller coasters and is the friend of many, myself included. Max, you will always be remembered. 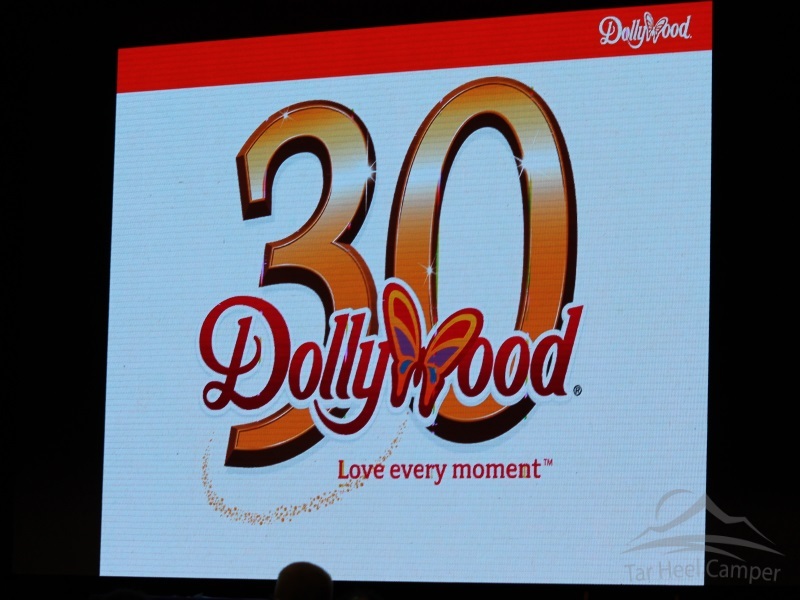 There are a large number of parks who are either in attendance or sent along a presentation. Parks included Dollywood, Six Flags Over Georgia, Alabama Splash Adventure, Kings Dominion, Holiday World, Six Flags Fiesta Texas and Lake Winnepesaukah. 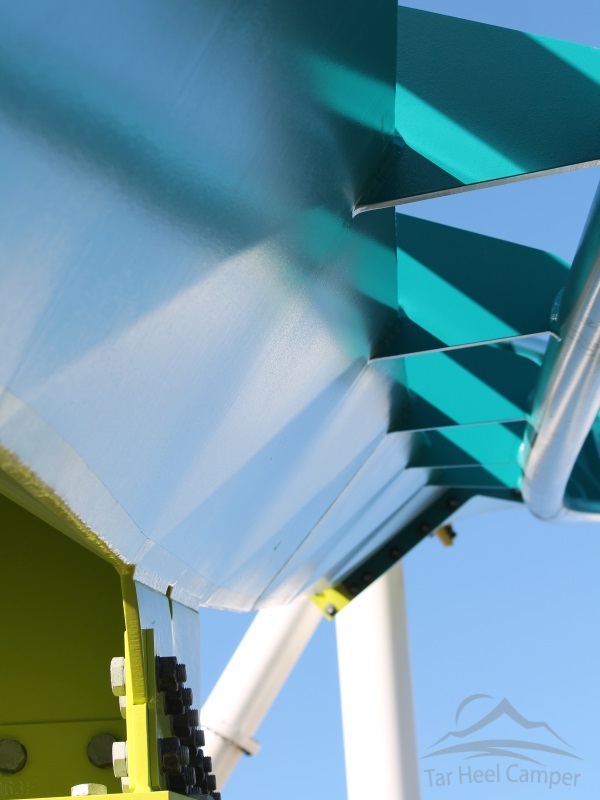 A specific slide that sparks emotion is the ‘before’ picture of Rampage at Alabama Splash Adventure. 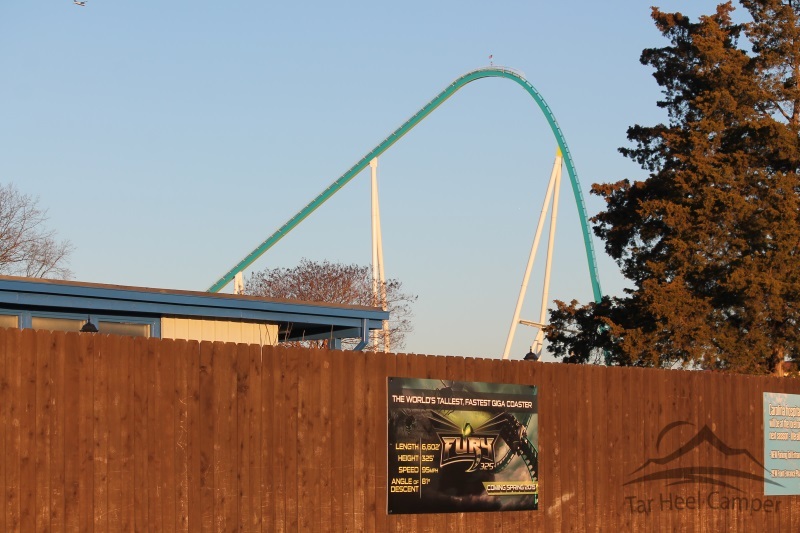 It’s hard to believe that the Koch family got that coaster running before the end of October 2014. 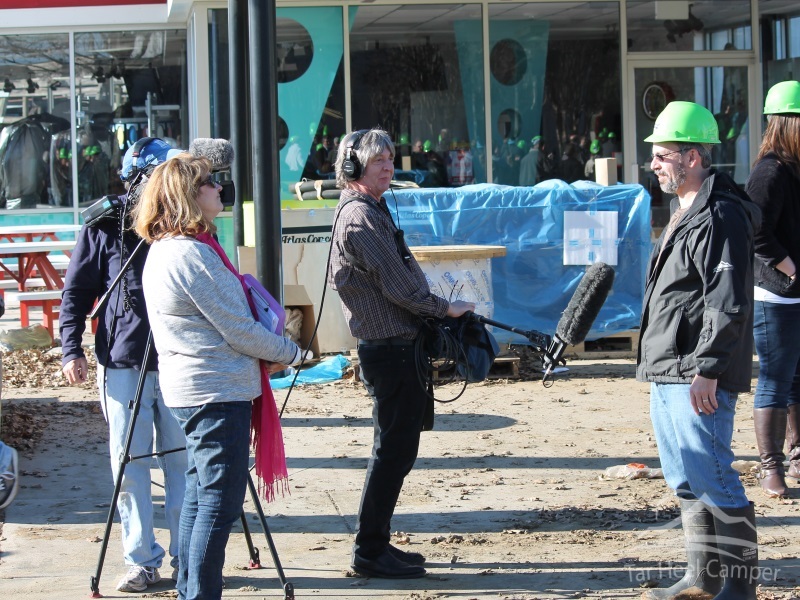 There i also a camera crew here, capturing footage for an upcoming Travel Channel documentary of the construction of Fury 325. 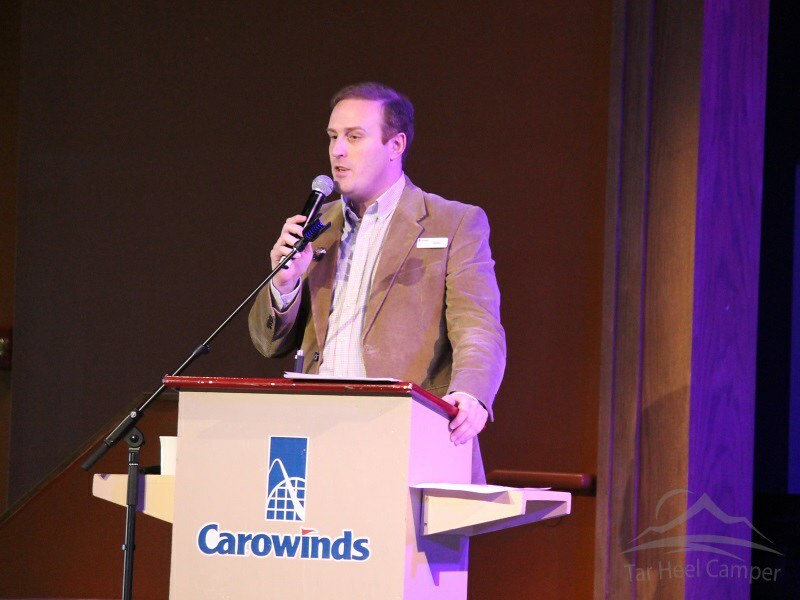 And then John Taylor, the Director of Marketing at Carowinds takes the stage. 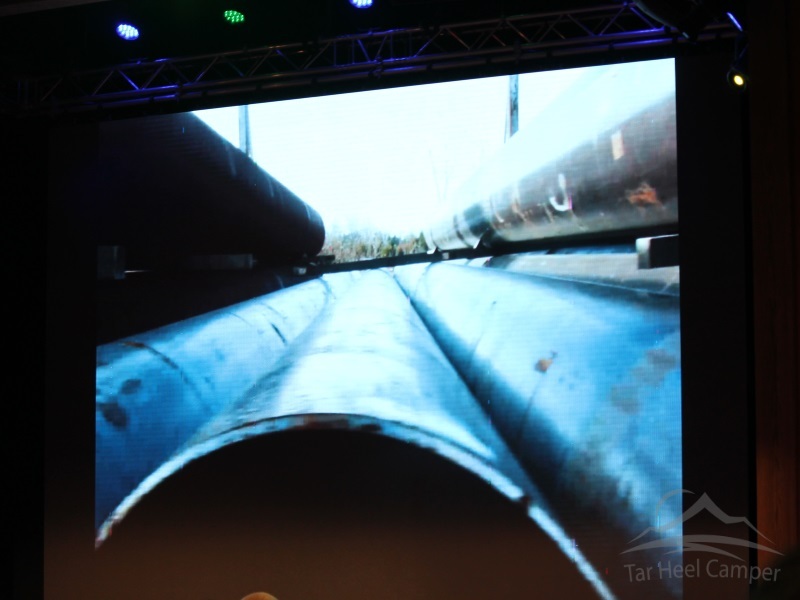 They present a video of their recent tour of the plant in Ohio that has produced all of the Fury 325 track and supports. 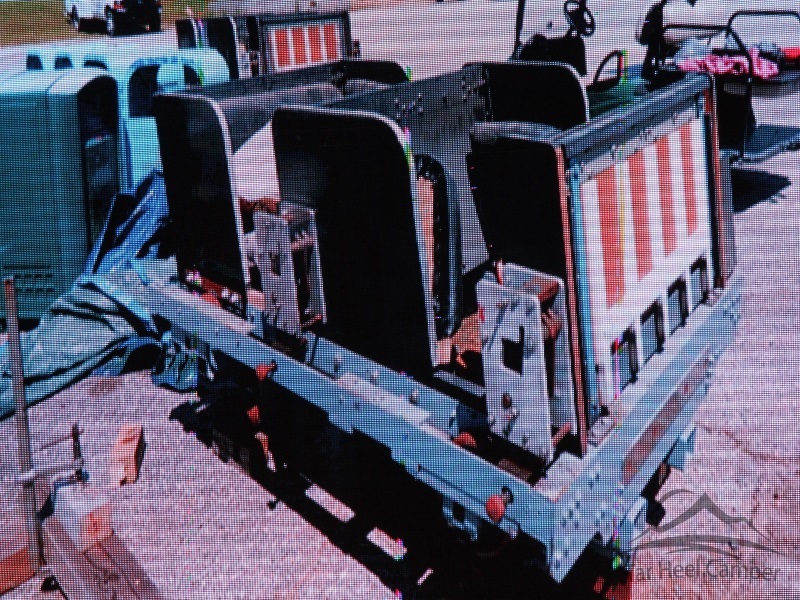 We get to see some footage of the last piece of track being fabricated. 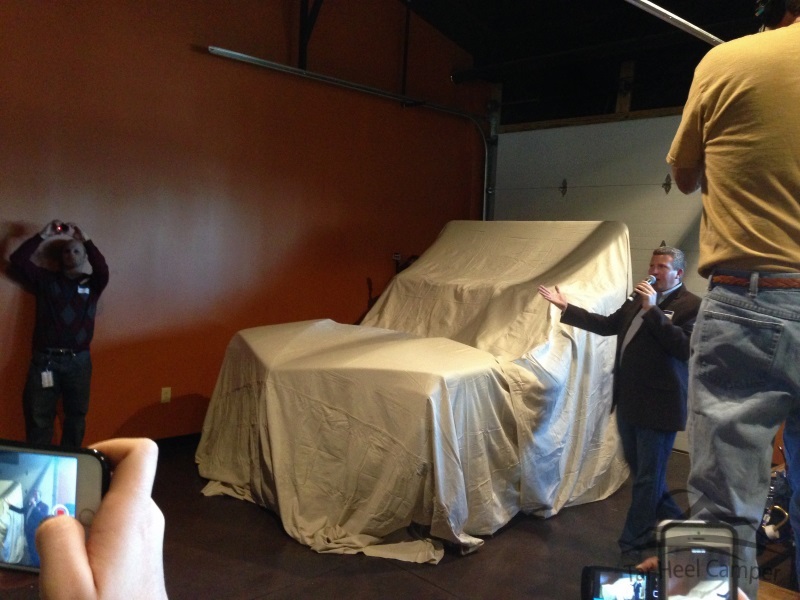 It is time to see what is under the tarp. None of us have a clue. 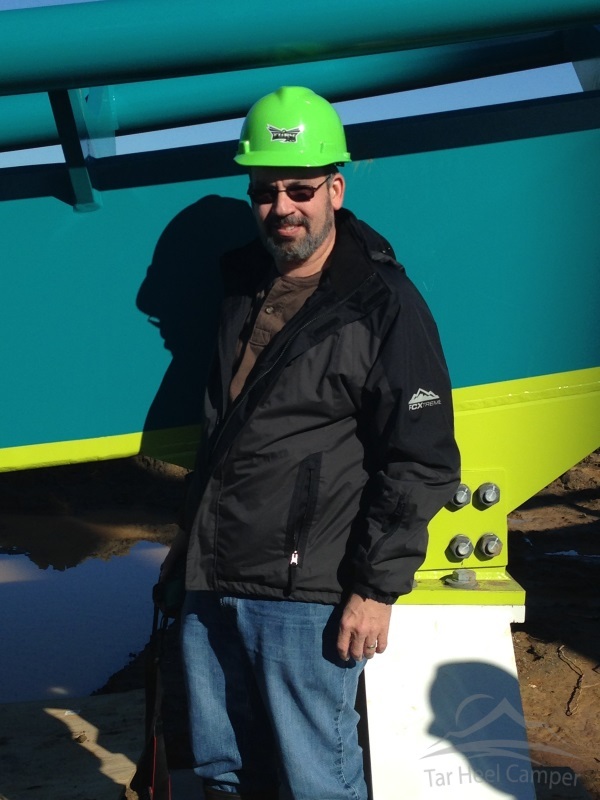 And it’s the first car of the first train for Fury 325! Some of the information presented can’t be shared. That is one more reason to attend Winter Warm Up next year. I look forward to seeing you! 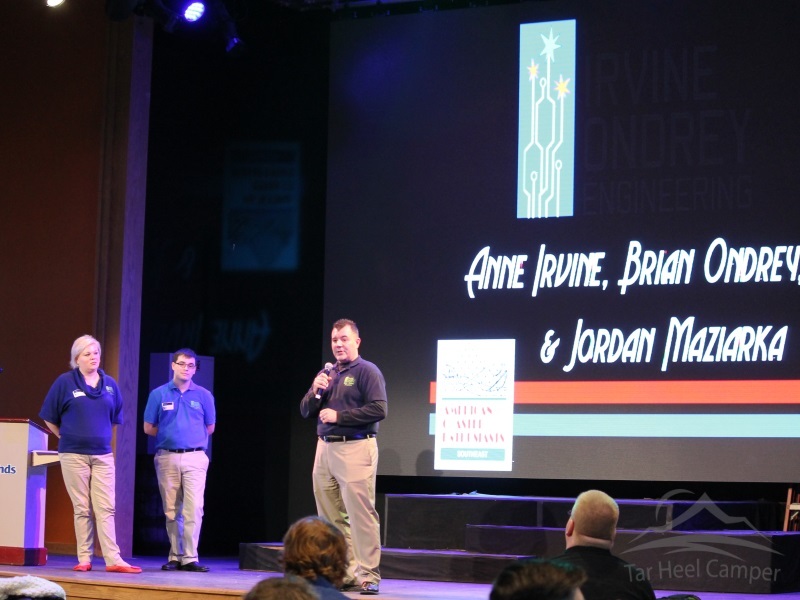 We are then given a special treat, a presentation from Irvine Ondrey Engineering, the firm who manufactures and installs the control systems for rides such as Fury 325. 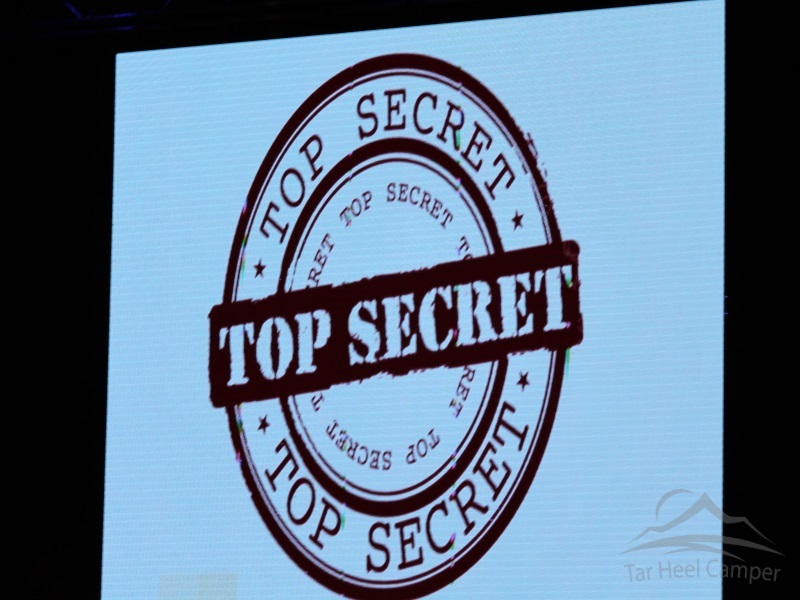 I won’t ruin the surprise and will let you hear about all the great food coming to Carowinds from their new executive chef. 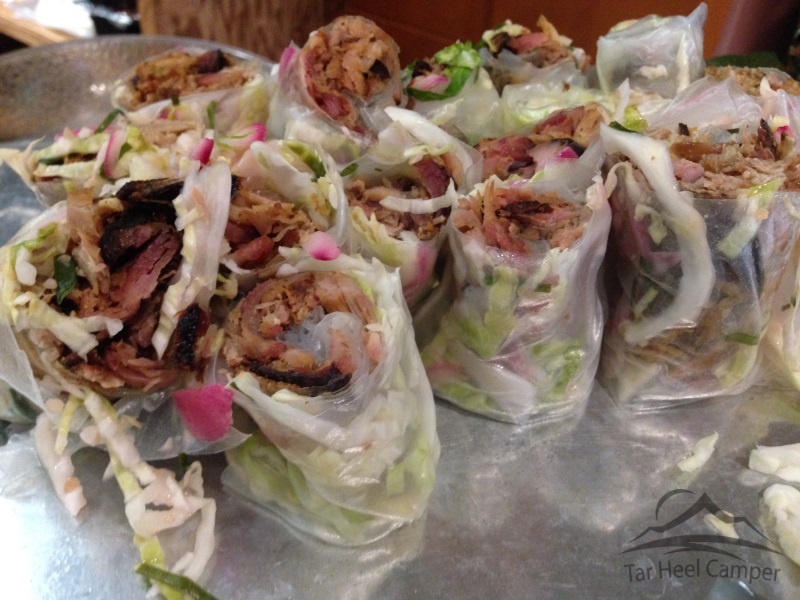 I will, however, give you a sneak peek and let you know the pulled pork spring rolls and blue crab ceviche are some excellent examples of the great food that Carowinds will be offering this season. 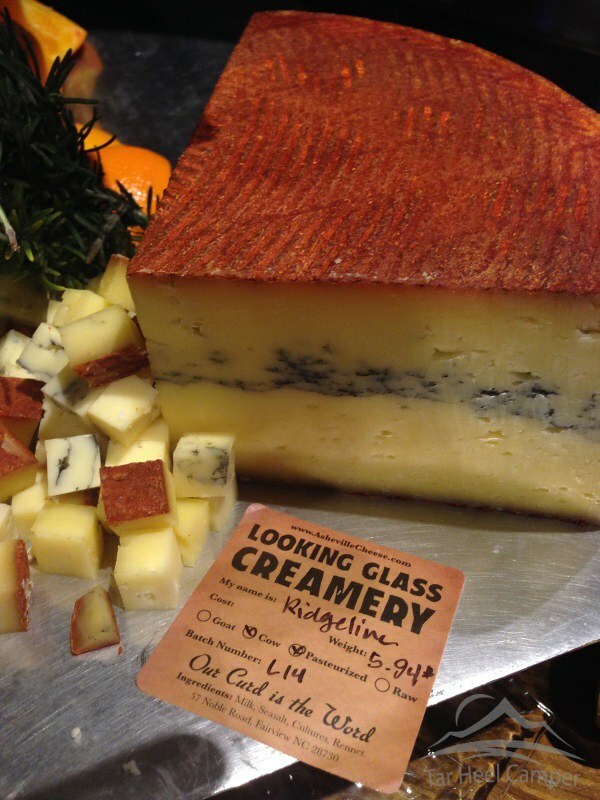 It is also great to see them supporting local farmers and businesses. 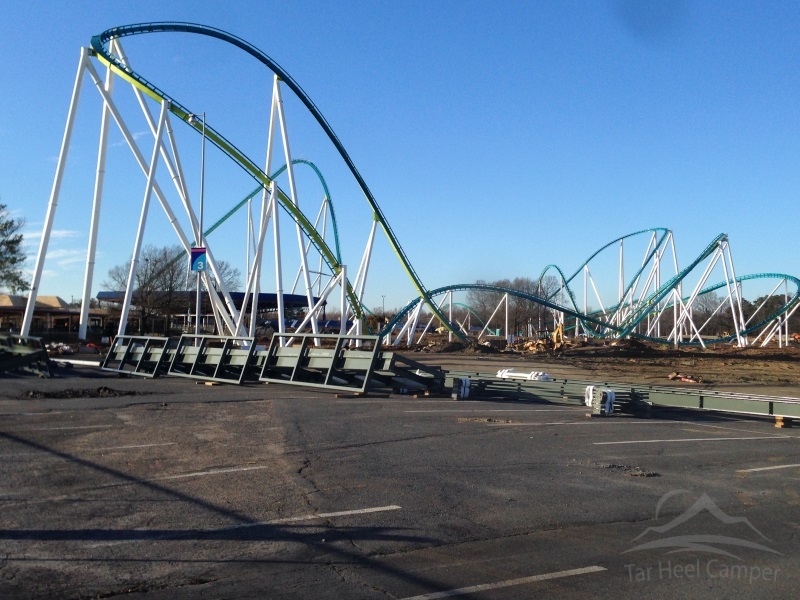 After we eat our fill, we head outside to see what Carowinds has been doing in the off season. 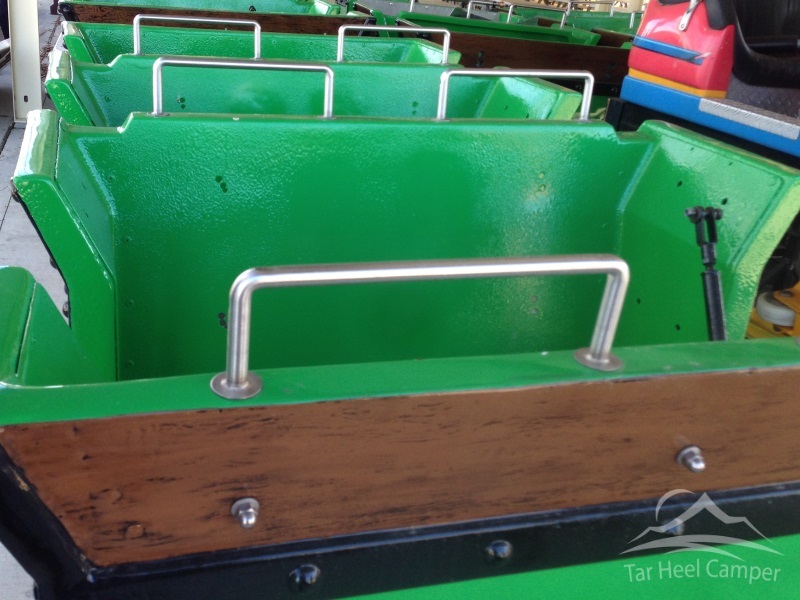 If you aren’t aware, they strip down all of the rides as much as possible, inspect them, and rebuild them each and every season. We won’t be hearing from him for awhile. 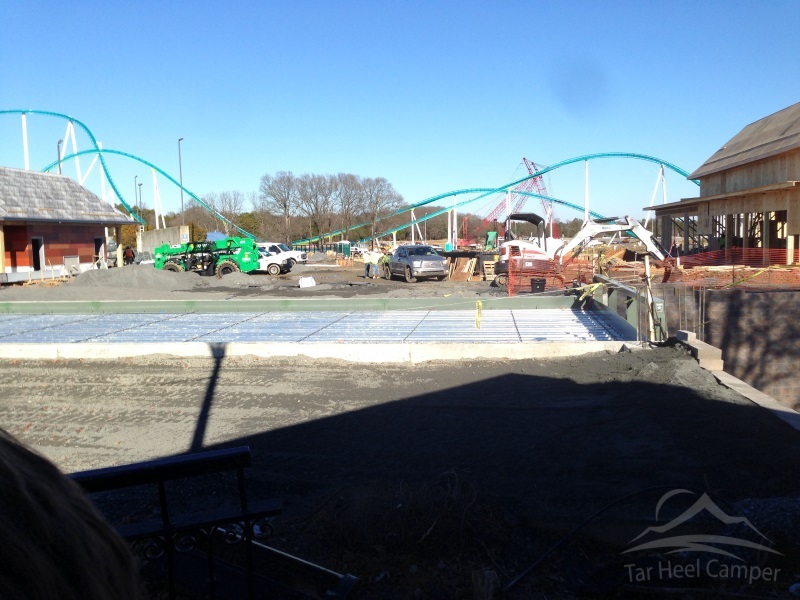 We now see the new wider bridge and front plaza area that is under construction. 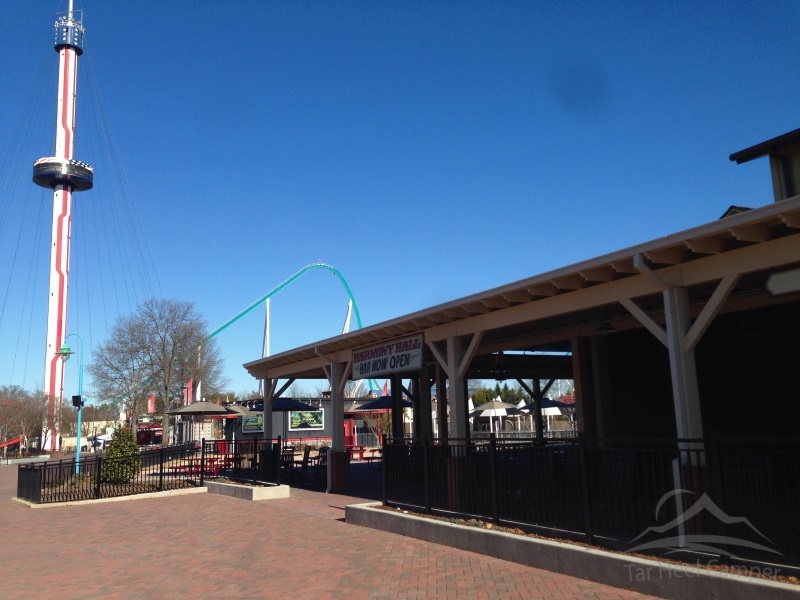 The view looks out to the entrance and parking lot from inside the park near the Carowinds plaza. 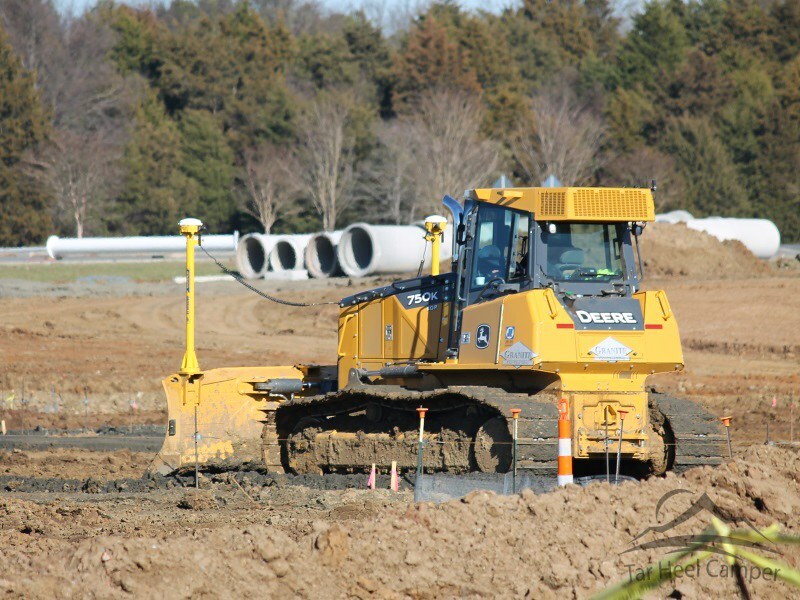 On the left of this picture is the new bathroom facilities and on the right is where a store and stroller rentals will be. 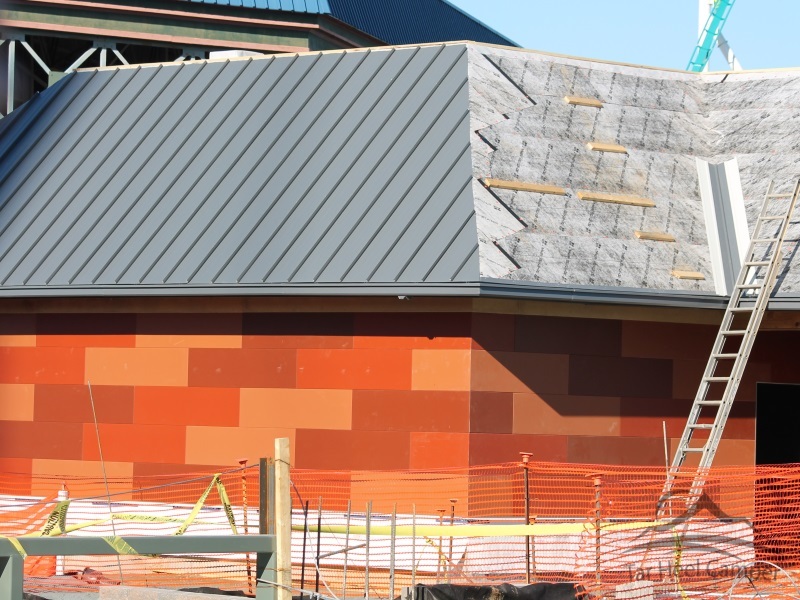 They are also adding a walk-in guest services beside the store. Here is a close up of the bathroom sporting bright cheerful tiles. On the left is the station with a gift shop below that is coming along nicely. 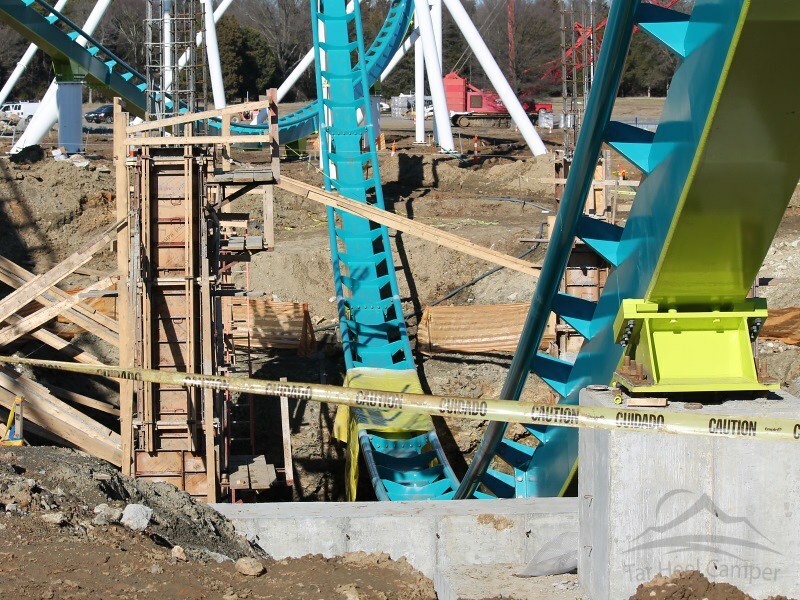 In the lower middle of the screen you can see where the track is not yet finished leading up to the brake run. 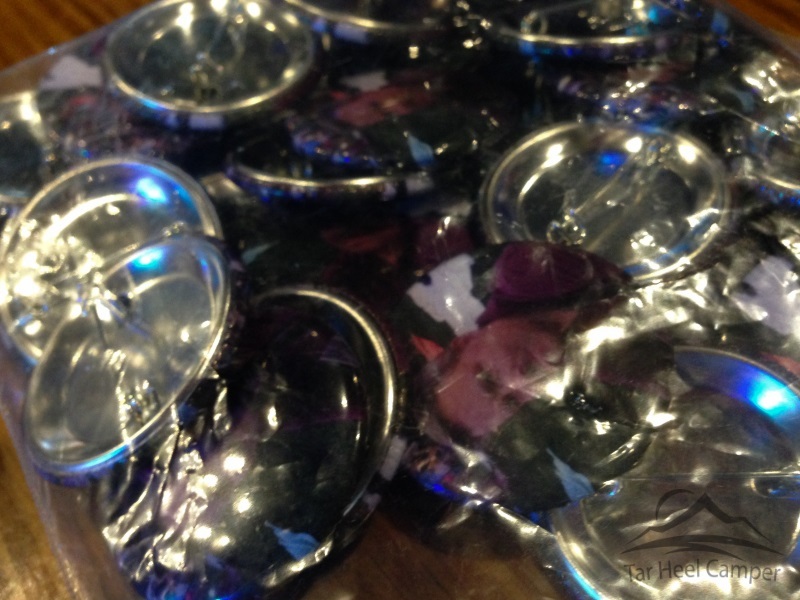 “Close up?” you ask? Why certainly. The crews are hard at work and dealing with a lot of mud from recent rains. 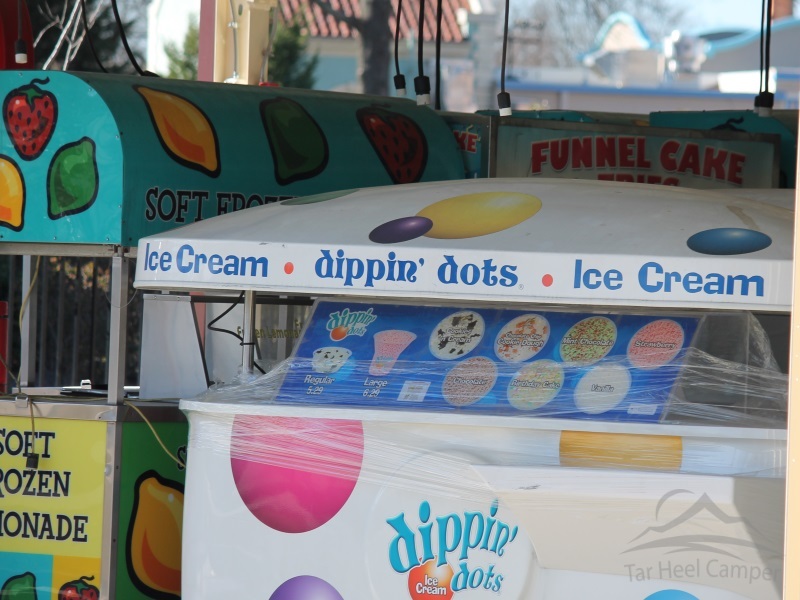 Don’t worry, they will be ready by opening day. 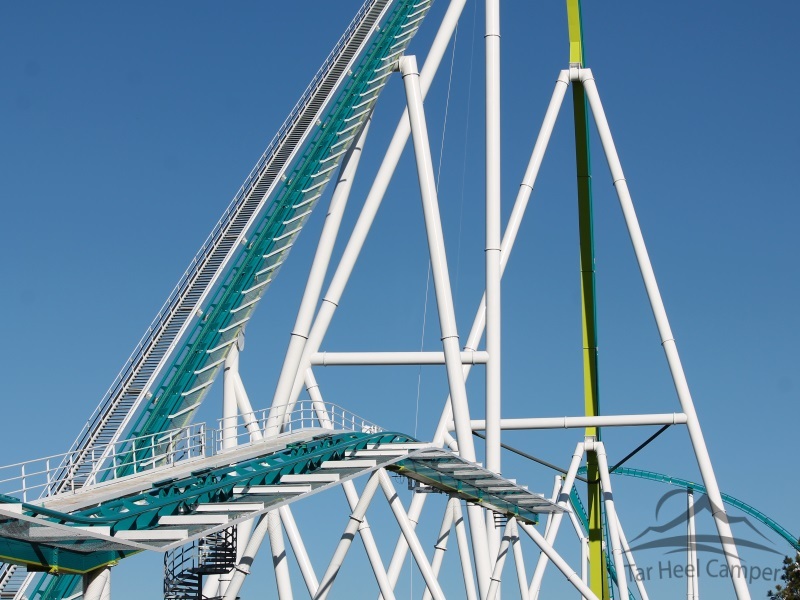 Part way through the course, Fury 325 will dive under the main pedestrian bridge. 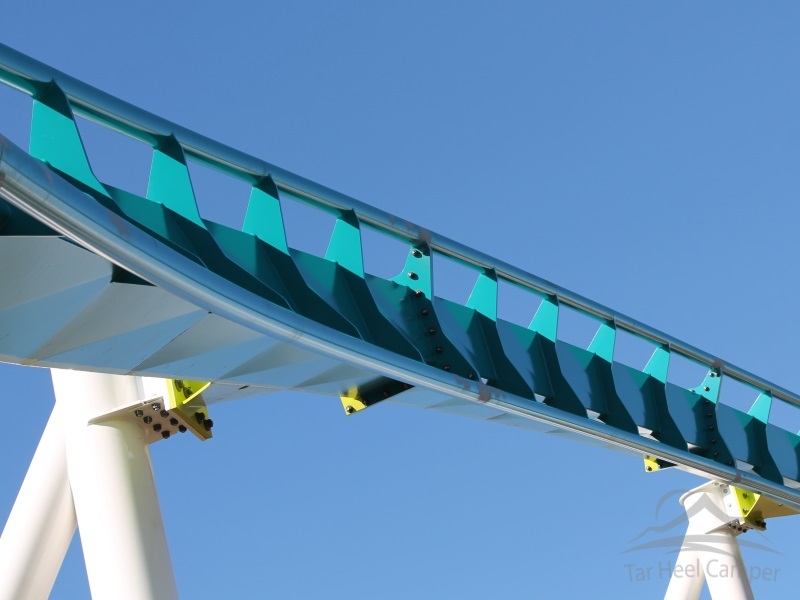 The angle of the track is so insane that it gives the illusion of being inverted. 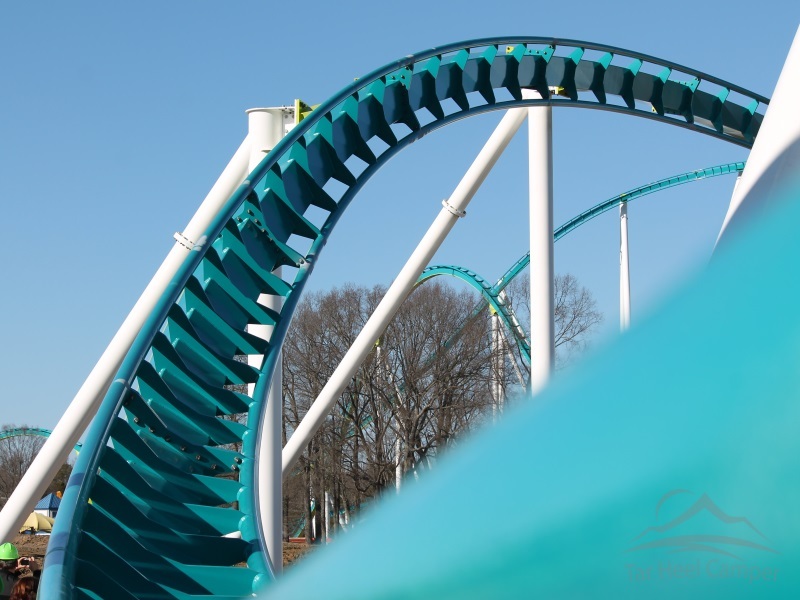 It is hard to imagine the speeds we will take through the twists and turns. 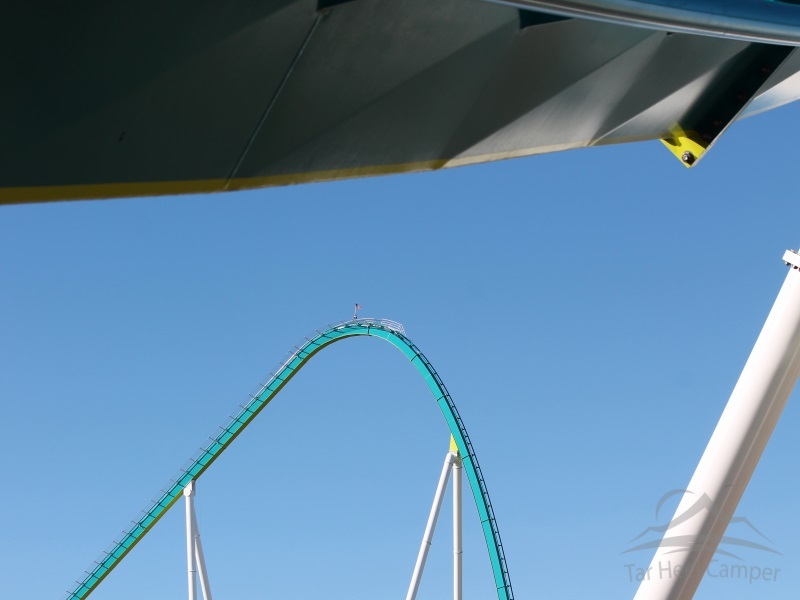 And off in the distance is the 325 foot tall lift hill that started it all. The colors really stand out. 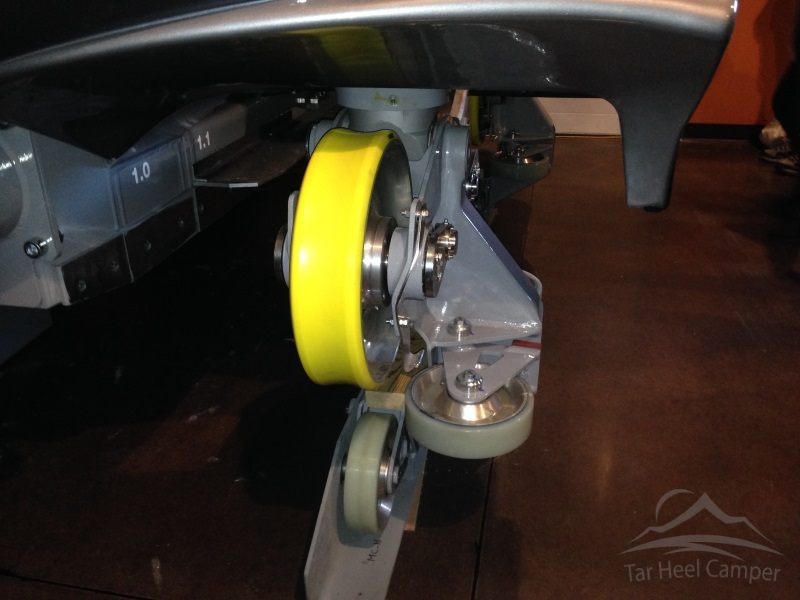 After installing the track, they go back and torque each nut to the exact specification. 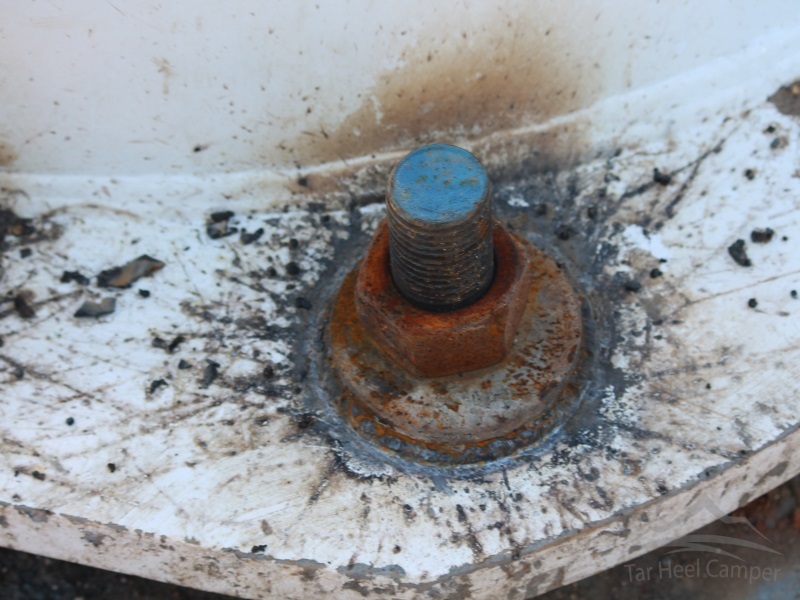 They then mark the position if the nut with paint to make the daily inspections easier. Here is another nut shot. 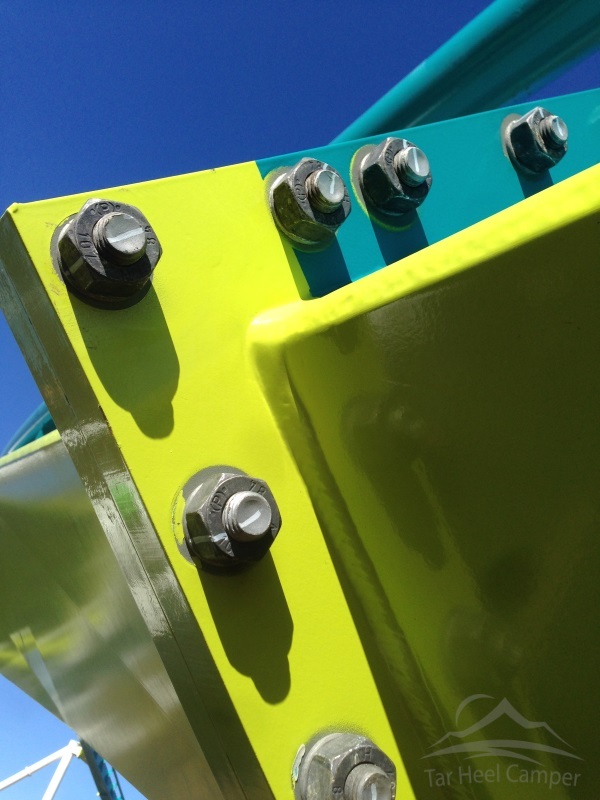 It’s interesting to see that they weld washers to the base of the supports after the nut is tightened. Somewhere along the way the film crew snagged me for an interview. Who knows, 2 seconds of my interview might make the cut. 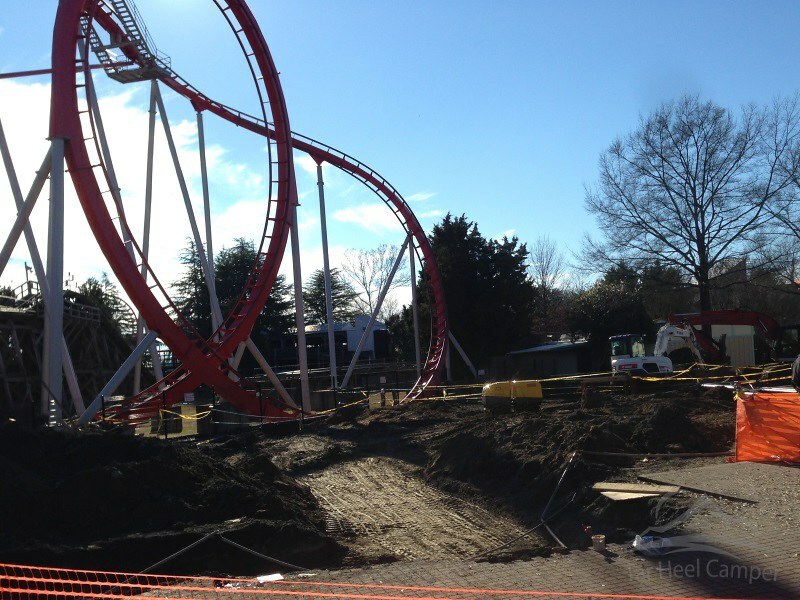 Over by Vortex we see that Carowinds has removed some game stands to make way for a SlingShot. 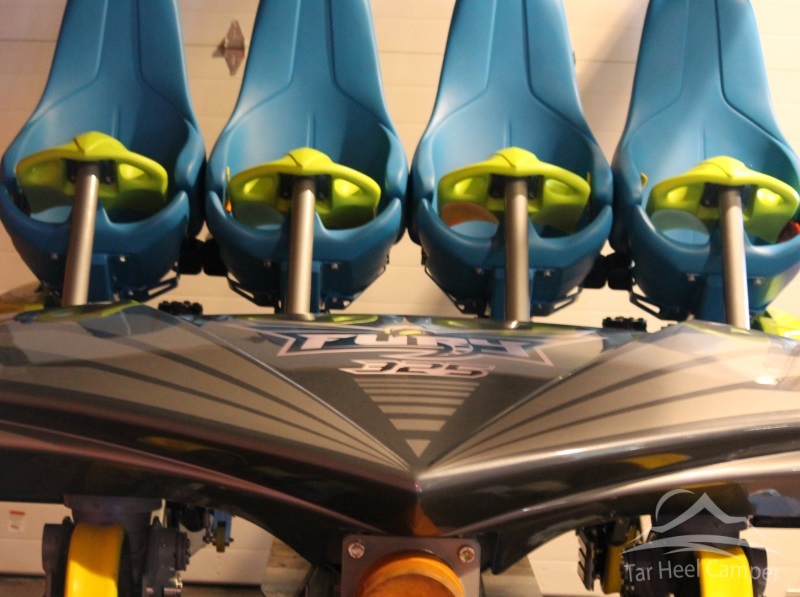 It will launch you 300 feet into the air opens this season. 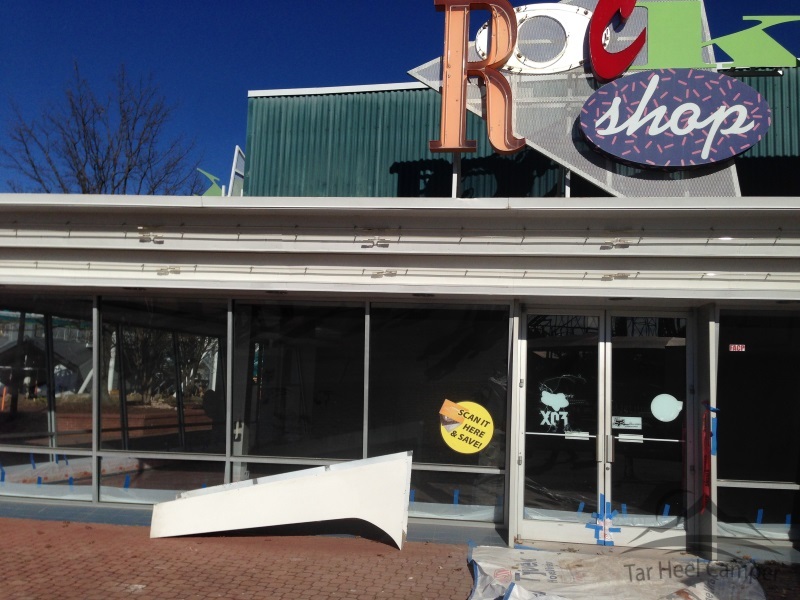 It’s also great to see the Rock Shop getting an overhaul as it becomes a Thrills store this season. 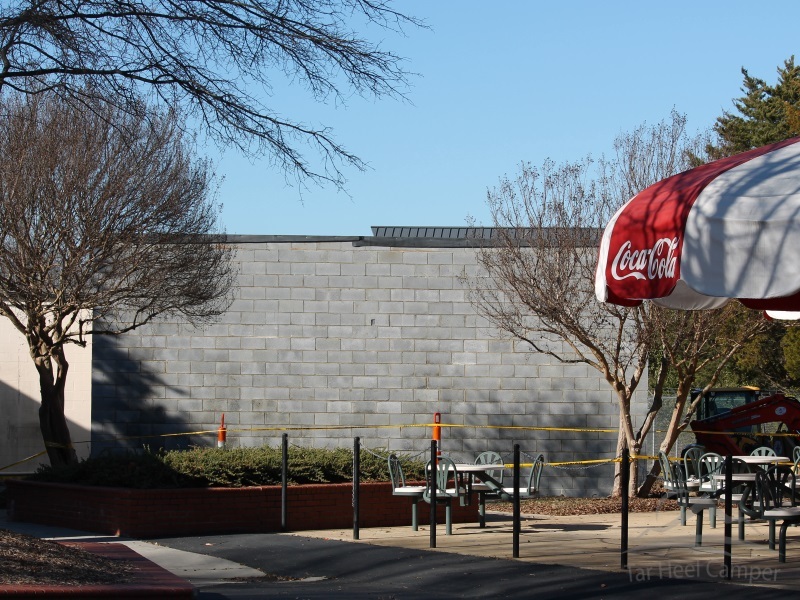 In other news, there is an addition to the backstage area of the Carowinds Theater. 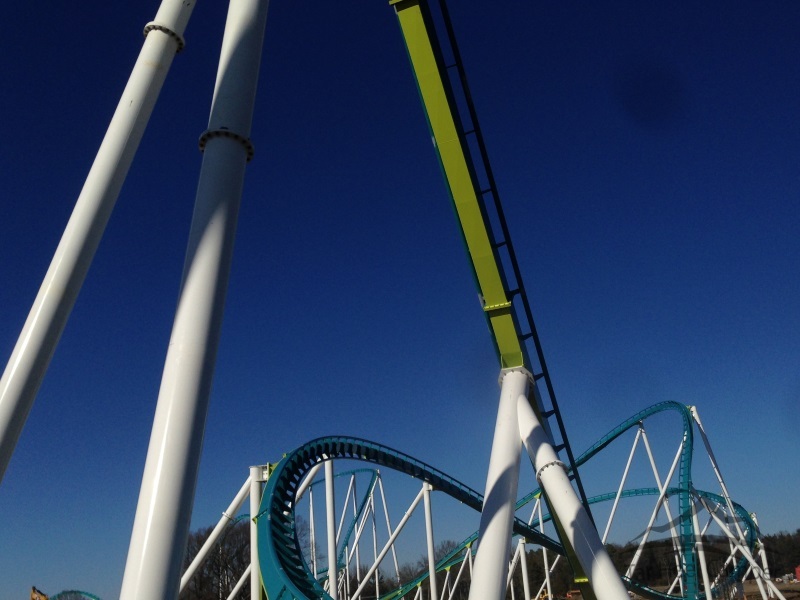 As the day wraps up we take one last look at Fury 325. 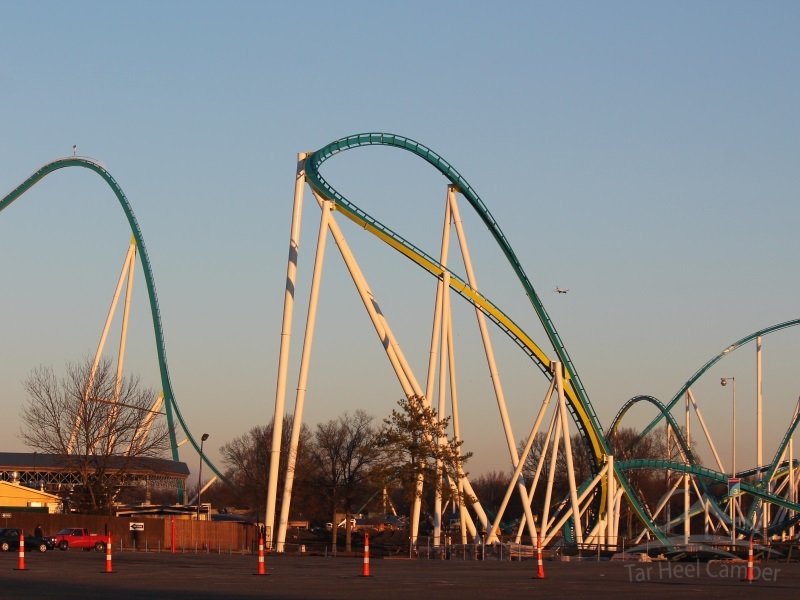 Thank you, Carowinds, ACE, and all the parks and people who made Winter Warm Up 2015 a great success! We’ll see you in 2016! 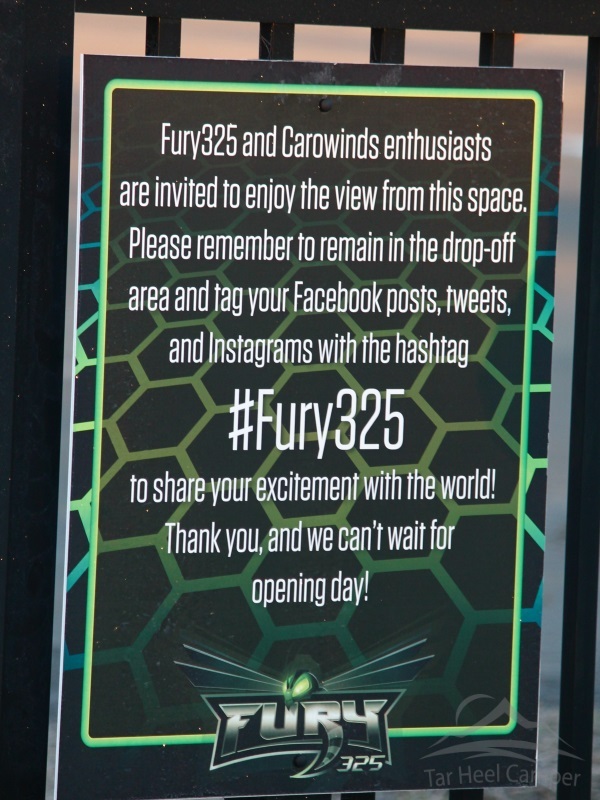 You can follow all things Carowinds with lots of speculation and discussion about Carowinds and Fury 325 at Carowinds Connection. 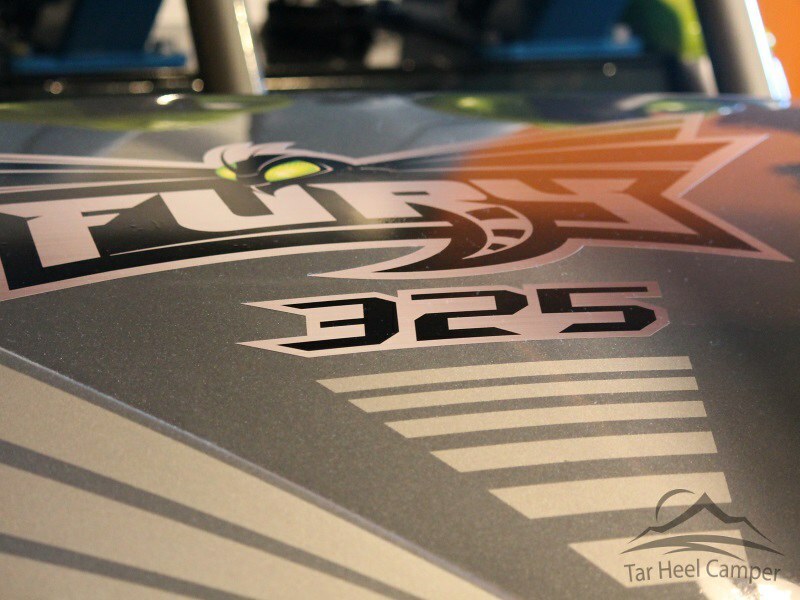 Tagged ACE, Carowinds, Fury 325.